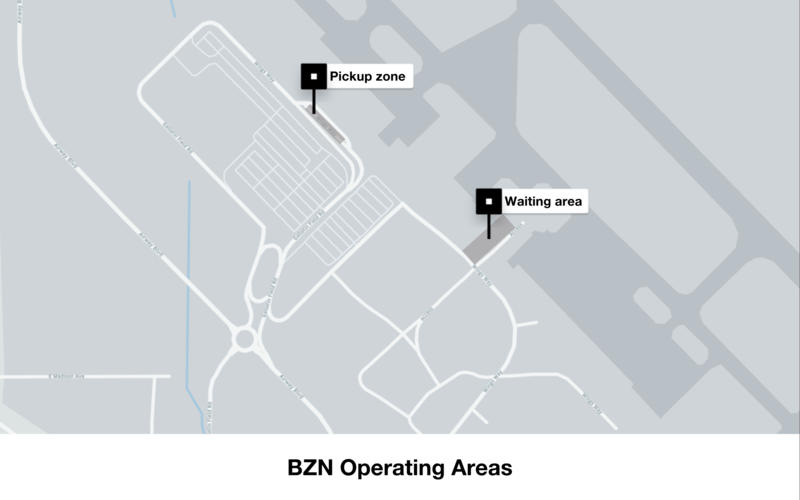 When driving at BZN, Learn how to receive these trip requests and get in on the action. We’ve instituted a special first vehicle in is the first one out (FIFO) system at Bozeman Yellowstone International Airport. The FIFO system only works within the designated, geofenced area and driver-partners waiting elsewhere will not receive trip requests through the Uber Driver app. The airport appreciates when partners display the Uber sticker (trade dress) on the vehicle’s windshield. Driver-partners can request this Uber sticker here. Based on the operating agreement with the airport, the waiting area is located by Wings Way where the U.S. Customs and Border Protection building is located. (see map below). Once you accept a trip request, the pickup location at the airport is located on the rideshare zone, on the left hand side of the curb in front of the terminal (see map below). Based on the operating agreement with the airport, riders can be dropped off at the curbside in front of the terminals. If you’d like to receive a trip request afterward, you’ll need to keep the Uber driver app on to maintain your place in the FIFO queue. Checking the arrivals schedule at Bozeman Yellowstone International Airport can help you maximize your earnings with information about when flights will be landing at the airport and when it will be busiest.